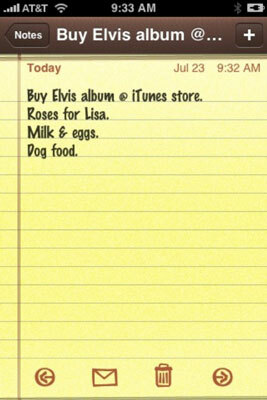 The Notes application on your iPhone lets you write text notes that you can save for yourself or send through e-mail. To create a note on your iPhone, first tap the Notes icon on the Home screen, and then tap the Plus button in the upper-right corner to start a new note. The virtual keyboard appears. Type the note. When you’re finished, tap the Done button in the upper-right corner to save the note. Check out the Notes application. Tap the Notes button at the top-left corner of the screen to see a list of all your notes. When the list is on-screen, just tap a note to open and view it. Tap the left- or right-arrow button at the bottom of the screen to read the previous or next note. Tap the letter icon at the bottom of the screen to e-mail the note to someone with the Mail application. Tap the trash can icon at the bottom of the screen to delete the note.